Located in the Stuart Addition, included in the National Register of Historic Places, Montclair Bed and Breakfast is a carefully restored c. 1880 Italianate Townhouse in Historic Downtown Staunton, Virginia. Guests will enjoy the relaxed ambiance of the Fox Hunt Decor. Montclair offers deluxe, personal service and overnight accommodations with your choice of rooms, a cozy library filled with reading material of interest to all; radio, television; parlor and dining room and a private sitting room. You will be welcomed with afternoon refreshments. Start off your morning with coffee delivered to your door, followed by a gourmet breakfast served in the dining room. By prior arrangement you may have breakfast in your room. Easily accessible via a short drive are the Museum of American Frontier Culture, Waynesboro Factory Outlet Stores, P. Buckley Moss Museum, Blue Ridge Parkway and Skyline Drive, VMI, W&L, JMU and Historic Civil War Sites. Charlottesville, Harrisonburg, Waynesboro, Lexington, skiing, canoeing, riding, and hiking are less than 35 minutes drive. 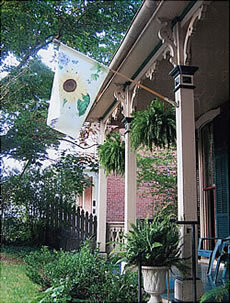 Make our Shenandoah Valley area Staunton bed and breakfast inn your home away from home on your next Virginia vacation.